Best NAS drive | Best buys | What Hi-Fi? 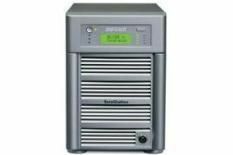 If you have a large library of digital music or you're thinking of creating one, a network attached storage device (NAS) might be the way to go. It not only stores your music but sits on your wireless network so streaming devices can access and playback the files. Buffalo's TeraStation Live Network Attached Storage (NAS) box has one terabyte of hard-disk capacity - that's over 1000GB, enough for 3000 Apple Lossless files.